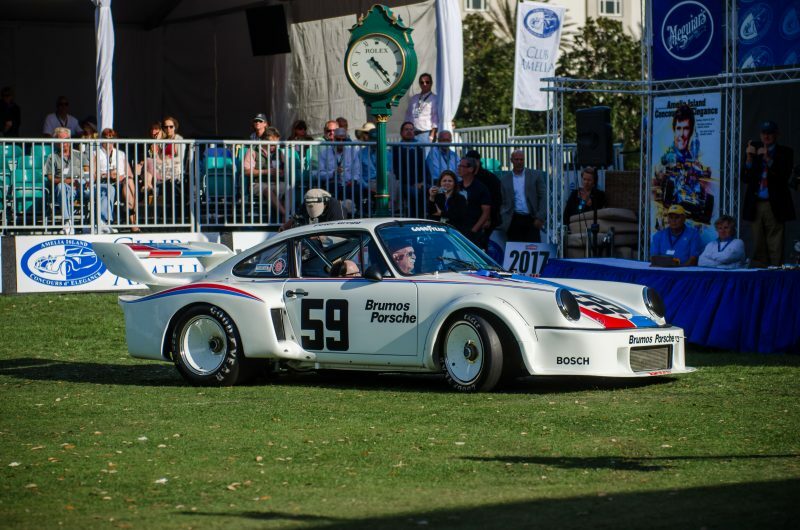 As the Amelia Island Concours D'Elegance continues to grow in size and prestige, it's almost too much to take in over the course of one day. So many cars, so little time. Such was the case this year when it came to the world of Porsche. Besides the special "Cars of Brumos" section, there were so many other Porsches to view, in such a large variety of classes, it was nearly sensory overload. What I wouldn't have given for more time. You could literally spend hours on each Porsche and still want for more. With that in mind, we thought we would put together this list of each Porsche that won an award during the show. This should give you some idea of the Porsche history and provenance that was on display during the Concours. After Porsche's dominance of the 1970 - 1971 sports car racing championship season, the successful Porsche 917 prototypes were banned from competition by the international governing body of motorsport. Porsche turned to the popular Can-Am Championship (Canadian American Challenge Cup) Series. Peter Gregg raced the car to a 9th place finish in the 1972 CanAm Championship. He then signed his co-driver, Hurley Haywood, to race the car in 1973. It was Haywood's first open cockpit series and he earned third place in the Can-AM series that season. The Brumos Porsche 917/10 is historically significant as it was the first Brumos race car to carry what has now become the iconic and recognizable white, red and blue livery with the Brumos "sweeps". by Porsche as a replacement for the 956 and designed mainly to comply with IMSA's GTP regulations, although it would later compete in the European Group C formula as had the 956. The 962 was introduced in 1984 and quickly became successful in the hands of factory drivers and privateers alike. It had a remarkably long-lived career, with some examples still proving competitive into the mid-1990s. Peter Gregg won six IMSA GT Championships and 41 victories during the 1970s. In 1979, this car #59 won eight races at Road Atlanta, Laguna Seca, Lime Rock, Brainerd, Mid Ohio, Sears Point, Portland and Road America. It also had a record setting eight straight pole positions at Hallett, Lime Rock, Brainerd, Daytona, Mid Ohio, Sears Point, Road Atlanta and Road America. The Porsche 935 is a 700 plus horsepower twin turbo capable of 200 mph plus. The Brumos 935 is thought to be the last remaining unmodified 935 in existence. The Super 90 is powered by a 90 horsepower, 1,582 cc OHV air-cooled horizontally opposed four-cylinder engine with dual 40 Solex carburetors coupled to a four-speed manual 741 transmission. It has independent front suspension with laminated torsion bars, parallel trailing arms, and tubular shock absorbers. At the rear there are independent swing axles with torsion bars and tubular shock absorbers. Stopping is provided by four-wheel hydraulic drum brakes. It rides on an 82.7 inch wheelbase, has a curb weight of 2,060 lbs. and has a maximum speed of 111 mph. The car is complemented by a driver's manual and service manual as well as a tool kit, travel kit and luggage set. For the 1960 season the FIA changed the regulations to try and bring sports-racing cars closer to normal road cars. They did so by modifying the rules for Appendix C (sports cars) to be more like Appendix J (GT cars). This required Porsche to modify the previously successful 718 (RSK) competition cars with a wider cockpit, wider and taller windshield, bigger doors and room allocated for the "FIA" suitcase. The new 718 competition car was called the RS60. 718-042 is one of the four factory works cars. The works features include split front torsion bars, fuse panel on the dash, inside windshield wiper, apex driving lights and accessory door tank. 718-042 gave Porsche its first overall victory at Sebring and the 1961 European Hill Climb Championship. 718-042 is arguable the most successful of all RS60s with 15 overall and 17 class victories. In 1977 Porsche AG built only ten 934.5s for racing in the USA. Brumos Porsche 934.5, 930 770 0952, is the second 934.5 produced. Peter Gregg won the 1977 SCCA TransAm Championship series. This car had eight 1st place finishes---Westwood, Nelson Ledges, Hallet, Brainerd, Mosport, Mid Ohio, Road America and Saint Jovite. Canadian Ludwig Heimrath protested the championship, but the SCCA upheld Gregg's Championship. The FIA later overruled the series win of Peter Gregg. Undaunted, Porsche protested and produced a poster commemorating Gregg's 1977 SCCA TransAm Championship series win with this car. In 1978 Bruce Leven was voted "Rookie of the Year" with the car in Bayside Disposal #85 livery. It only raced in 1977 and 1978 and was then placed in storage unseen for over 25 years. The six-cylinder 3.0 liter engine produced 590hp. 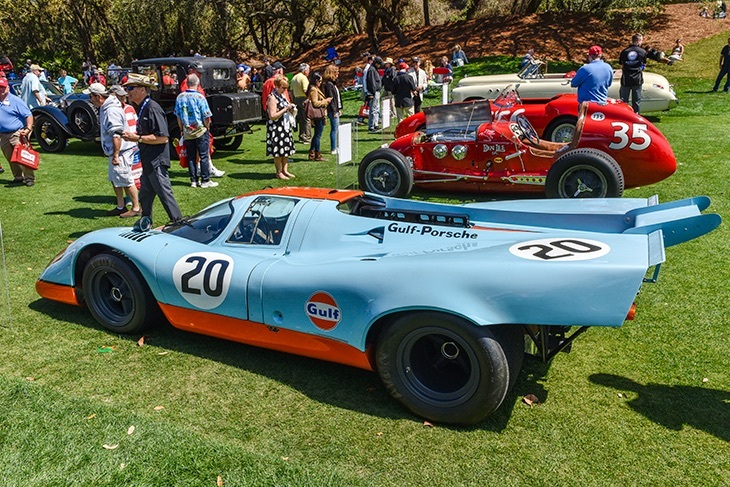 Featured* in the Steve McQueen cult classic on endurance racing, "Le Mans", this 1969 Porsche 917 was sponsored by the GulfWyer Team and led literally two lives during its World Manufacturer's Championship run. Chassis #004 you see here was originally numbered #017. Unfortunately, #004 was crashed at the '70 Brands Hatch race and recoverable parts were transferred to #017 and its number was changed to #004. Thus it depends on one's interpretation as to whether the history of this car begins with the first appearance of the original #004 or the original #017. It competed in a number of races in Europe and scored a win at the 1970 Spa-Francorchamps 1,000 Kms with Pedro Rodriquez and Leo Kinnunen at the wheel. It also achieved several top 10 finishes with such drivers as Brian Redman, Jo Siffert and David Piper. *This 917, while appearing in the film Le Mans (seen in clips of actual race footage that make up parts of the movie), should not be confused with chassis #020 that was actually used in the making of the movie and owned by Solar Productions at the time (now owned by Jerry Seinfeld). RSK #718-028 is one of the rarer of all Porsche racing cars. This center seat RSK is one of six built and one of four left in existence. Dubbed "The Giant Killer" it was much smaller than its competitors. It converts from a two seat left-hand drive to center steer in a few hours time. This is the only car to ever compete in Formula 2 and Sports Car racing, finishing seventh at the 1959 U.S. Grand Prix in Sebring, Florida. It was built in April 1959 and sold to Christian Goethals in Belgium. It was successfully raced by Goethals for one season and then returned to Porsche to be fitted with a 1,600 cc engine. The car remained at the Porsche factory, unraced, until it was sold to a United States buyer in 1974. It was raced briefly, resold and stored until purchased by the current owner in 1990. This 550 Spyder was the 1955 Paris Auto Show car. The car was sold to Sonauto in France and raced. This car is pictured in the book, “Porsche 356,” which states that it was Jean Behra's Spyder. 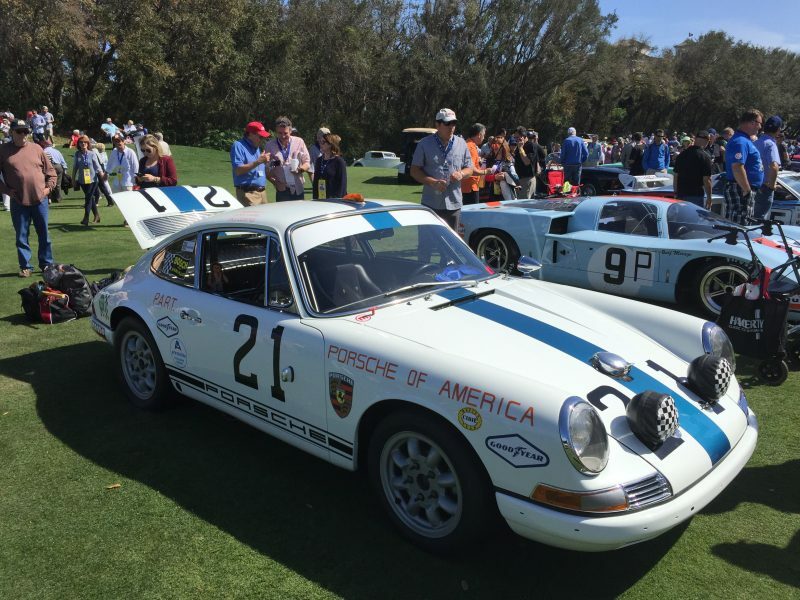 The car was owned from 1973 to 2002 by Jim Perrin, noted Porsche historian and past president of PCA. The current owners acquired the car in 2007 and began an extensive refurbishment with the goal of preserving as much of the original paint as possible. They carefully removed the top coat of silver paint while retaining the original blue paint underneath. The engine in the car was originally in another Sonauto race car and was rebuilt. The car retains the original tool kit and owner's manual. This 911 T/A P.A.R.T. factory race car was special ordered by racer Jim Netterstrom through Joe Heishman's Porsche. It is believed this special race car is one of only three built by the factory with full Trans Am racing options. Jim raced this 911 from new in SCCA and Trans Am as well as Sebring, Watkins Glen and Daytona in 1968 and 1969, the latter most notably as a member of the Porsche of America racing team. P.A.R.T. was formed by Bruce Jennings with the backing of Porsche to compete as the first factory backed 911 racing team in the United States. This lasted for just the 1969 race season. Codrivers of this 911 included Bruce Jennings, John Kelly, Bob Bailey and John Sabel. It has recently been restored in P.A.R.T. 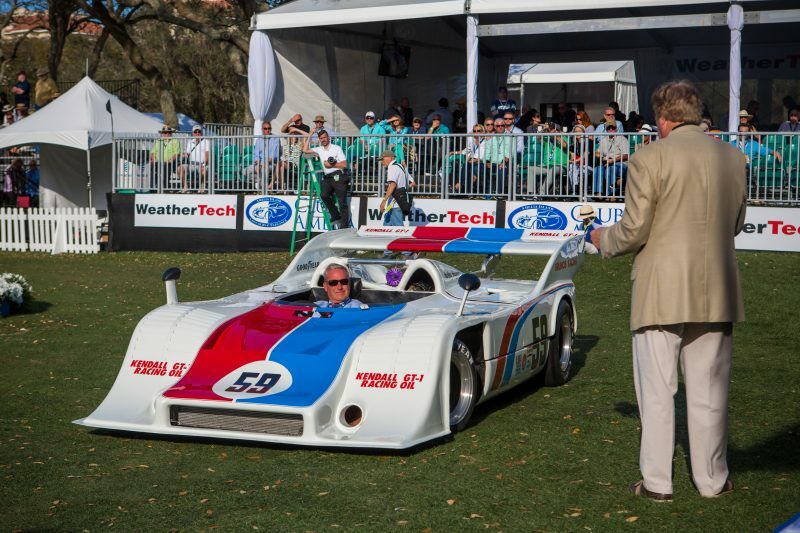 livery appearing exactly as it raced Daytona in 1969.
,Great photo story. Great show on Amelia Island. Thank you…. In photo #4, is that a bird on the guy’s left shoulder? Don & Carol Murray truly a class act. Great photos.